I just tried the Big King from Burger King, which is obviously the BK attempt to outdo McDonald's Big Mac. Food NEVER looks like it does in promotional pictures. So I won't hold that against them. Though I should note there was certainly no leaf lettuce or lettuce of any kind included on the burger I just bought. I did not have time to take a picture of my sandwich. I was hungry and ordered the Big King spontaneously. My son asked for a Burger King cheeseburger. So I just picked something I hadn't had a thousand times before. Even though the pictures never tell the true story, this one seems to suggest something different. Look at the full leaf of lettuce- not like the shredded iceberg McDonalds uses. Look at the full, thick slices of onion. 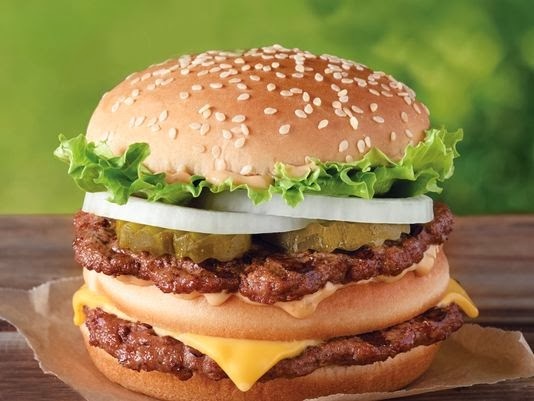 To me, Burger King is trying to say this is like the adult's Big Mac. Their drive through has a sign that says something like "Taste the broiled difference." I remember when BK made a point to say they weren't that child's Happy Meal place with the clown. They are The CROWN, Dammit! Where you can get a grownup char-broiled fast food burger. No wimpy diced onions and shredded lettuce here! The execution was just a mouthful of bland. The sauce, which I haven't mentioned yet, didn't look or taste anything like Big Mac Sauce. The color resembled cheese sauce, and it tasted like nothing. It had no zip, tang, NOTHING. It was just there. The price was $5.99 for a small meal, which is the same as a Big Mac meal in this market. If you want a tasty burger in a similar configuration, my local Frischs' Big Boy offers the "Big Boy." Like McDonald's, the sauce is a highlight- it actually tastes like something. Big Boy sells jars of their sauce in the restaurant. I don't think there will be any demand for bottled Big King sauce. When it comes down to it, the Big King is not a premium burger offering. It's like a value menu item without the value. If you just need something a little filling, there is nothing about this that makes me want to spend more than $1. The Mcdouble from McDonald's and any of the value menu burgers from Wendy's are much tastier and cost almost $3 less. It appears that the Big King replaced the Double Stacker in the BK meal lineup. Even the BK stackers offered much better value than the Big King, in my opinion. What really does this in for me is the lack of any taste. It's 2 burgers and 3 pieces of bread, with American cheese and weak sauce.